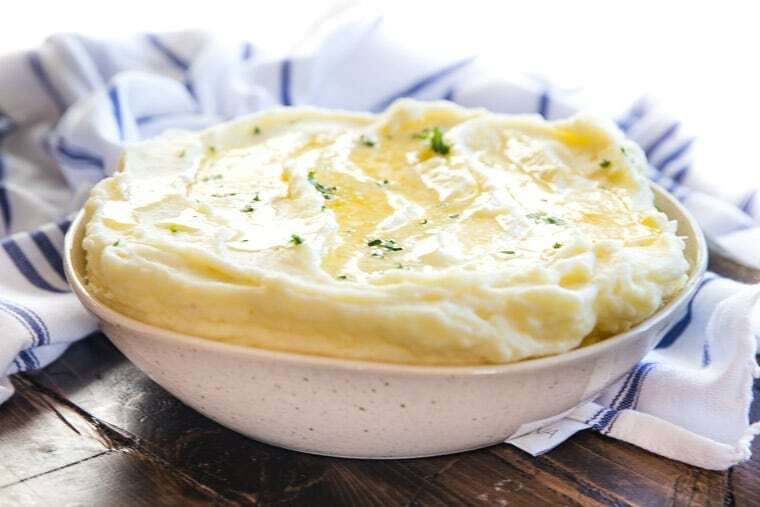 Home » The BEST Mashed Potatoes Recipe! 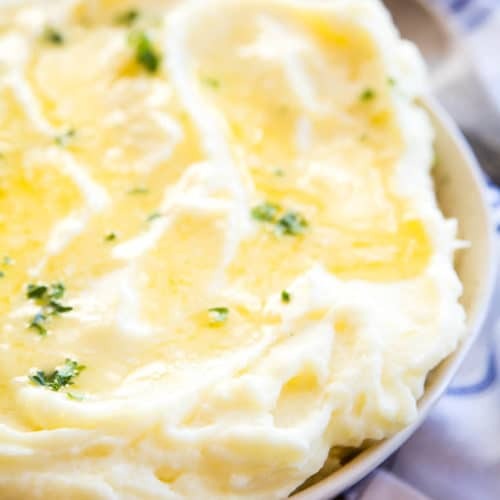 Want to know how to make light, fluffy, buttery mashed potatoes? 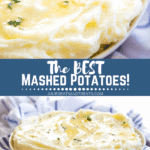 This is the BEST Mashed Potatoes Recipe and you will love them! They come out perfectly creamy every single time. They are easy enough to make for a weeknight dinner, but so delicious you can make them for all of your holidays like Thanksgiving, Christmas and Easter too. You’ll never look for another way to make these whipped potatoes! Can we take just a moment and revel in all that is mashed potato? I mean, don’t you want to just dive mouth-first into this lovely bowl of creamy goodness? I can’t believe it’s taken me this long to share basic mashed potatoes with you. I’ve shared my Instant Pot Mashed Potatoes, Make Ahead Mashed Potatoes and Crockpot Mashed Potatoes. Somehow I overlooked these delicious, but basic mashed potatoes! It was all I could do when shooting photos of this easy mashed potatoes to keep the fingers of my little ones from dipping into this potatoey goodness! How could I blame them?!!! Just look at how amazing these taters look! 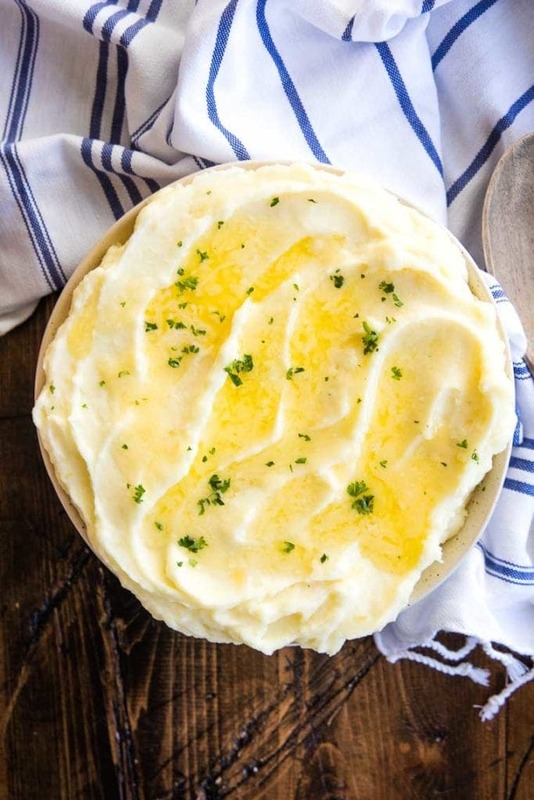 Yes, creamy mashed potatoes swimming in a lake of butter and topped with fresh parsley! Throw Chicken Fried Steak on top of these potatoes and I’ve died and gone to heaven! As pretty as it is delicious! Life just doesn’t get any better than that! You know what else is amazing? This Cornbread Dressing straight out of the south! I had never had this type of stuffing, but once I did I knew I was in love! If you need a main dish to make with these this Pot Roast Recipe is to amazing! Yukon gold potatoes make the BEST mash; they are creamy without being too starchy. Scrubbed well you can even leave the skin on if you choose! Mash the potatoes when they are HOT, do not wait until they cool down. When they are hot they will be easier to cream and not be as apt to get lumpy. Taste, taste, taste! Because you’ll be adding the liquid a bit at a time (never add it all at once!) taste as you go. That way you’ll know if they need more butter, salt or pepper. Make sure to warm your milk before you add it! Finish with a flourish, swirling the potatoes into creamy mountains and crevices. Then dot additional butter here and there. A sprinkle of chives or parsley makes it as pretty as it is delicious! What Potatoes Make the BEST Mashed Potatoes? You should choose a higher starch potato like russet or yukon golds to get the fluffiest, smoothest and most flavorful mashed potatoes. We prefer Yukon golds around here! Red or white potato varieties are waxy and require most mashing to become creamy. This cold lead to the dreaded “potato paste” instead of the light, fluffy mashed potatoes we all love! So how exactly do you get the BEST mashed potatoes? Peel potatoes and quarter them. Add the potatoes to a large pot. Cover with cold water. Bring to a boil. Cook for about 15 minutes or until easily pierced with a knife (check several potatoes, not just one), drain. Warm the milk – do not let it boil. Using the whisk attachment, mash potatoes lightly by hand to break up the potatoes. Fit the whisk attachment on the stand mixer and start on low speed, then increase to medium speed. Slowly drizzle in the warm milk. As the potatoes are mixing, slowly add the softened butter, 1 tablespoon at a time. Season the potatoes and whip to combine. Top with fresh parsley or chives if desired. No time to make these on the big day? No problem! Make them ahead and reheat the potatoes in the oven, delicious! If you’re looking for more easy potatoes recipes, here are a few of my favorites! Garlic Parmesan Mashed Potato Casserole, Twice Baked Potato Casserole, Instant Pot Mashed Potatoes, Mashed Potato Casserole, Easy Cheesy Scalloped Potatoes. 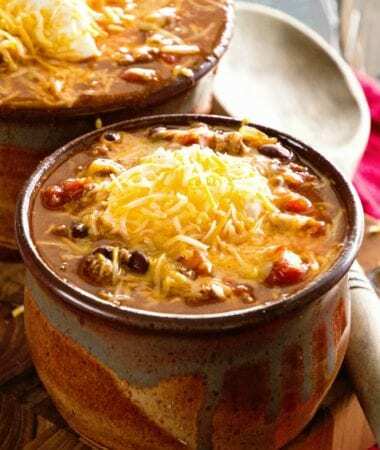 Don’t forget to comment below and give me a five-star rating for this tasty recipe! 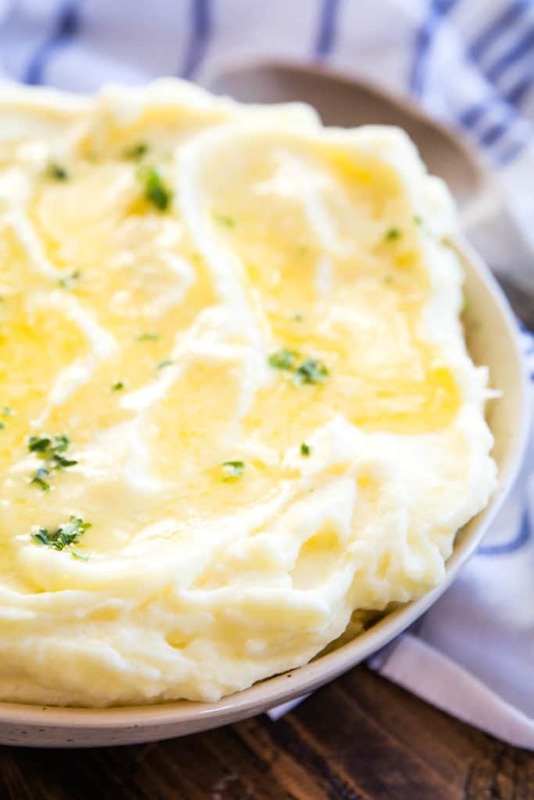 Want to know how to make light, fluffy, buttery mashed potatoes? 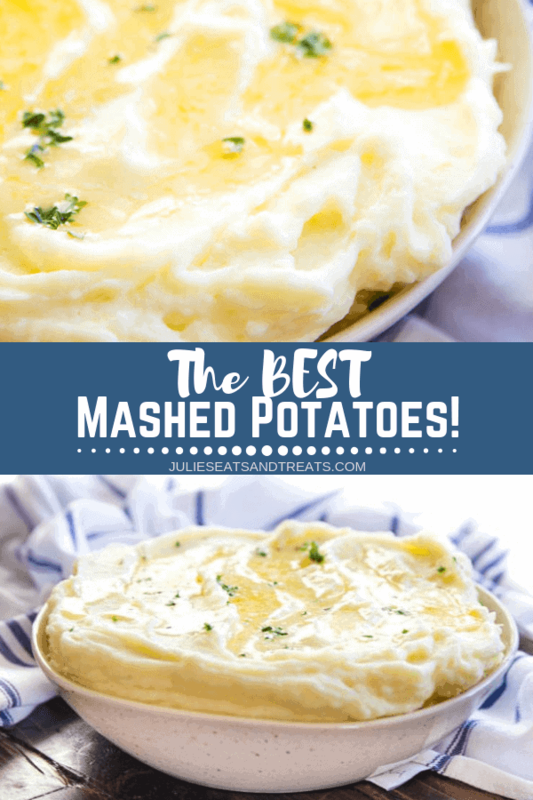 These are the BEST Mashed Potatoes and you will love them! They come out perfectly creamy every single time. They are easy enough to make for a weeknight dinner, but so delicious you can make them for all of your holidays like Thanksgiving, Christmas and Easter too. You'll never look for another way to make these whipped potatoes! Peel potatoes and quarter them. Place potatoes in a large pot and cover with cold water. Bring to a boil and cook until easily pierced with a knife about 15 minutes. Drain well. Transfer to bowl of stand mixer.Take the whisk attachment and mash potatoes lightly by hand to break up. Fit the whisk attachment on the stand mixer and start on low speed for 30 seconds. Increase to medium speed and slowly drizzle in the warm milk. While the stand mixer is on with whisk attachment slowly add softened butter, 1 Tbsp at a time waiting a few second between additions. Add salt and pepper and whip to combine. Top with fresh parsley or chives if desired. Holy hannah – those look amazing, and the picture makes me so hungry! I never thought of warming up the milk before, but it totally makes sense! Mashed potatoes are my favorite food! If I had a choice between mashed potatoes and cake, I would choose the potatoes! I’ll have to try making them in the mixer! The mixer makes it so much easier! I love using my mixer for making mashed potatoes!! Love all your tips thanks for sharing!! It makes the lightest and fluffiest potatoes!